I’m late. I’m on my way to podcamp uk in Birmingham but forgot that the Victoria line is subject to many and various improvements. This was my first mistake of the day. I think. Maybe I made some others before that, but if I did, their consequences haven’t come home to me yet. So I waited patiently for the replacement bus service. Watching the thin clouds roll by over Pimlico Tube Station and being patient. 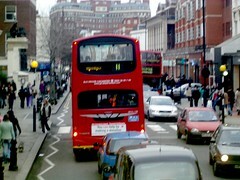 The woman next to me suddenly shrieked at the man over the road “Is the bus coming today then?” He smiled, “To Victoria? Yes.” “Not tomorrow then” she muttered. By the time it arrived there were five or six of us. Two hipsters who had probably been up all night assumed their place at the front of the queue, just behind the shrieking woman. A west-end cosmetics sales girl joined me in silent acceptance, and I went upstairs. At Victoria I approached a pair of men in Underground vests marked “Happy to Help” – happy perhaps but sadly unable to help in English. I realised that actually I just wanted to talk to someone to explain what had just happened to me, perhaps admit my mistake, have a laugh about it. But no, I just got advice that the No. 73 goes to Euston. I could have made myself later by insisting on having the conversation I wanted but perhaps it was best to just go downstairs and get on a train. Finally sitting on a tube, I watched a crowd of 19-year-olds (eek! maybe younger!) wandering in a substance-related haze, shouting at each other trying to find the way out. Times have changed. When I were a lad none of us would have been anywhere near as chatty – our drugs were depressants. We had just as late nights, but not nearly such noisy mornings. Euston at 07.28 – next train to Birmingham at 08.17 so time for an overpriced Americano in Caffe Ritazza (where I wrote the bulk of this) before squeezing into a second class seat (where I wrote the rest) with handy access to screaming toddlers, tutting pensioners, a lady knitting a lilac cardi sleeve and chatty sub-sloane gels with their arses hanging out of their jeans.